The third molars in the upper and lower jaws are typically called wisdom teeth. Wisdom teeth usually erupt into the mouth around 18 years of age. About 50% of patients wisdom teeth never completely erupt into the mouth but are under the bone and soft tissue. This is called impaction. There is usually insufficient space in the jaws to accommodate the developing third molar. This causes the tooth to become malpositioned and impacted which results in a number of problems the patient will usually experience. The two greatest problems we see are infections and cysts. Because wisdom teeth are very far back in the jaws and are malpositioned, it is extremely difficult to keep them clean. It is almost impossible to brush and floss between the second and third molars and to brush behind the wisdom teeth. 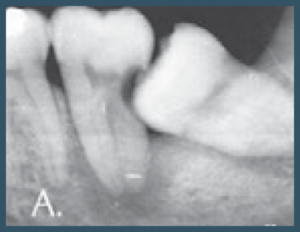 This will result in decay and infection of the wisdom teeth and sometimes the second molar (see Picture A). Unfortunately, if the third molar is not extracted at an early age, the second molar may develop significant decay necessitating extraction of both the second and third molar. Cyst formation can be a very serious problem for the patient. If the tooth does not erupt through the tissue to become exposed in the mouth, the tissue that grew the tooth (follicle) can develop into a cyst. Cysts can become very aggressive causing loss of jaw bone and adjacent teeth. Cysts can be completely prevented by simply removing the wisdom teeth (see Picture B). Wisdom teeth cause other problems such as movement of front teeth or other teeth especially after orthodontics, localized pain and discomfort, local swelling and infections of the surrounding soft tissue, cheek biting, ulcers, bad taste and mouth odor, difficulty opening and closing the jaw, headaches, maxillary sinus problems, periodontal disease and an increase in bacteria in the mouth and surrounding teeth. Recent literature has indicated that retained wisdom teeth can also cause chronic inflammation locally and at distant sites throughout the body (1,2). 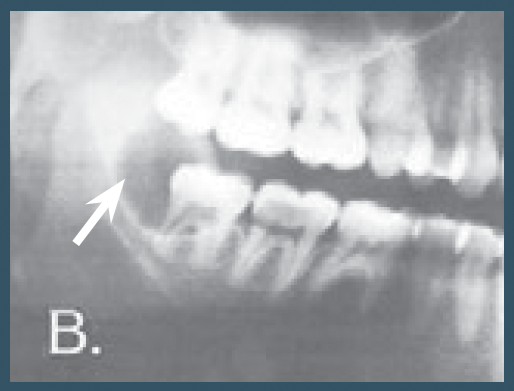 To determine if you have wisdom teeth, a panorex x-ray can be taken. The removal of wisdom teeth can be performed very comfortably under IV sedation or general anesthesia. It is always easier to remove wisdom teeth at an early age before problems develop. 1. White, R., Offenbacher, S., Phillips, C., Haug, H.,Blakey, G., Maciani,R. Inflammatory Mediators and Periodontitis in Patients with Asymptomatic Third Molars, J Oral Maxillofac Surg 60: 1241-1245, 2002. 2. Journal of the American Dental Association, Special Supplement, the Oral-System Disease Connection, Oct. 2006. Check out our locations and call us to make an appointment for a consultation.